In just a few weeks, Merrill Simpson will officially become “Dr. Simpson” when she graduates from Colorado State School of Veterinary Medicine. She will be joining more than 1,500 new veterinary graduates from the 30 accredited US schools. But what makes Simpson’s graduation extra special is that it almost didn’t happen. Like most of us, Simpson grew up with an innate desire to help animals. She always planned on attending veterinary school. However, during her senior year at Rutgers University, this New Jersey native had a major change in plans. Simpson applied for a pharmacovigilance position at a Fortune 500 company and started immediately after graduation. “My new plan was to begin a career in the animal health industry,” says Simpson. Simpson worked as a Drug Safety Specialist where she reported cases of adverse reactions and product efficacy issues. In 2014, she joined some of her colleagues on a veterinary mission in Nicaragua. During the mission, Simpson helped vaccinate thousands of animals as an effort to stop the spread of preventable diseases like rabies. Although Simpson enjoyed her time in the corporate world, she couldn’t stop the lingering feeling that she may have made a big mistake. 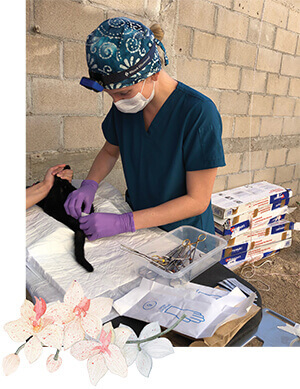 “Volunteering in Nicaragua made me realize that if I didn’t pursue my dream of attending veterinary school, I would likely spend the rest of my life feeling incomplete,” says Simpson. Soon after, Simpson began the grueling process of applying to veterinary colleges. Much to her delight, she was accepted at her top pick, CSU. One of her best friends joined her for the road trip to Fort Collins, driving more than 2,000 miles in her red Mini–Cooper. She entered veterinary school with a plan to specialize in equine medicine, but later decided to pursue other interests. Simpson also says that following renowned criticalists Dr. Justine Lee and Dr. Garret Pachtinger of VETgirl has further influenced her decision.